The Snapdragon processors 665, 730 and 730G are Qualcomm's latest mid-range SoCs. The 730G is particularly interesting as it is a specifically gaming-focused chipset. AnTuTu was able to test these new products and compare them to their predecessors. The results are unexpected in parts. 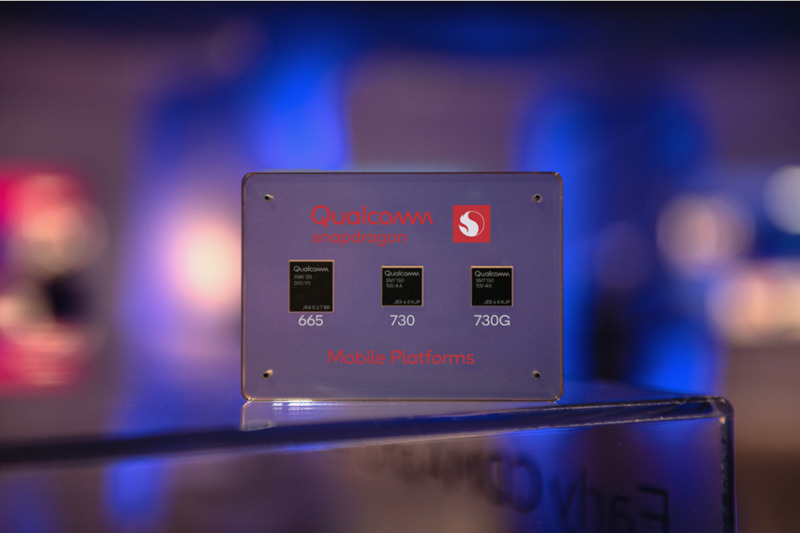 The new Snapdragon (SD) 665, 730 and 730G processors were unveiled at the start of this week (on April 9, 2019). They are intended to replace the SD 660 and 710 of yesteryear, and also compare well with the SDs 675 and 670. 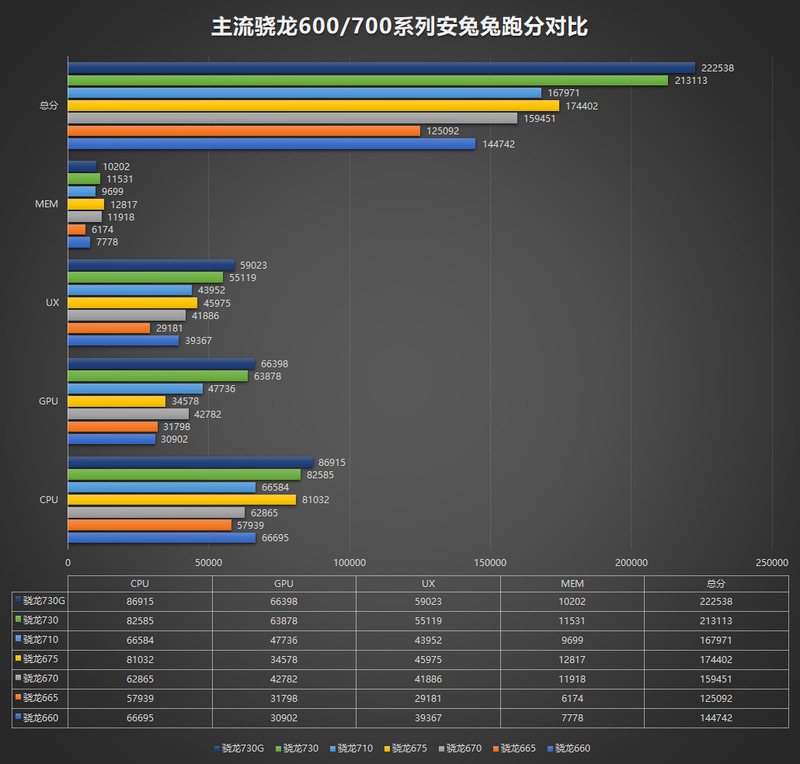 Shortly after their launch, AnTuTu got hold of reference or commercial devices containing all of these chipsets in order to make a comparative study of their respective scores on its well-known battery of benchmark tests. Accordingly, these devices included the SD 660-powered Redmi Note 7; the Vivo X23 to represent the SD670, and the Xiaomi Mi 8 SE for its SD 710. The benching authority reported that the SD 730 scored a total of 213113, or significantly more than the SD 675 reference device and the Mi 8 SE. The SD 730G did even better: it scored 222538. Interestingly, AnTuTu claimed that this chipset's CPU ran at 2.4GHz, whereas Qualcomm's press release indicated that it is supposed to be the same as that of the SD 730. 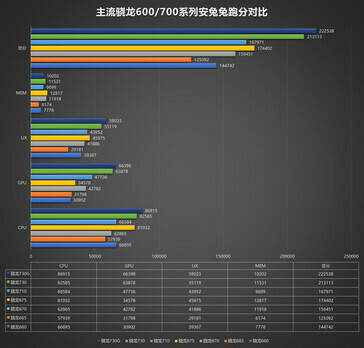 Its GPU was found to run at 825MHz as expected, however, compared to 700MHz for the non-G 730. The SD 665 was an even bigger surprise to AnTuTu, however, and not for any good reason. It scored 125092 - less than its predecessor's total score. Despite its CPU's new, reduced footprint (11 nanometers compared to the SD 660's 14), its scores in this part of AnTuTu's testing were significantly reduced compared to those of the 660. The SD 665's GPU is also an improvement on paper; however, it was reported to have done only "slightly" better than the Note 7 in this regard. Therefore, it appears that the SD 730 and 730G may be the better options of this new crop of mid-tier smartphone processors. On the other hand, this is a very preliminary test involving reference devices; OEMs may be able to get more out of the apparently disappointing 665 with more time and development. In addition, real-world tests may tell different stories than benchmarks alone.